We are professional historians and licensed private guides, who work in Kyiv city and regions of Ukraine. We provide private tours for foreign guests and for locals as well. We offer customized and personalized programs and routes, depending on your preferences, interests and wishes; interests; length of stay (from 4 hours to several days); group size; budget frames; mobility; preferred places to start / end of the tour. We offer tours around Kyiv city and from Kyiv to the most popular and famous destinations all over Ukraine. If you have an interest to very specific place / town / village, which are not indicated in our list, tell us about that and we will combine an optimal variant of the route for you. We are ready to travel with you practically to any place of Ukraine. 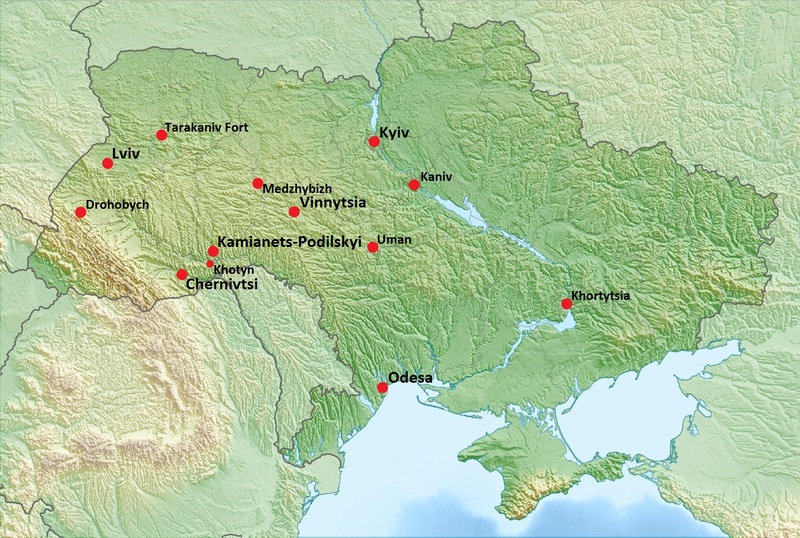 We are a little more, than tour guides, local outhentic historians with a passion for Ukrainian and Eastern European history. We will bring this region history alive while see old sites. We can help you also with transportation and any type of vehicle. We offer to make an acquaintance with Kyiv city, which has a history of more than 1500 years. Our tour can be planned a way, giving our guests the main idea about the city. Or we will find for you the thematic objects from the list. Of course, we will show you not only ancient historical places and objects, but also we'll tell you about the modern life of Kyiv and Kyivans. The duration of the excursion longs from 2 hours (very quickly and shortly, only exteriors) till several days (more detailed, visiting all the most important sights). The excursion can be started either from the place of your accommodation, or we can meet you at any appointed place, or pick you up just at the airport, railway / and bus station. We choose an appropriate type of the vehicle (a car, 6-8 sits minivan, 18-25 sits bus), depending on the quantity of tourists. Enjoy Kyiv, Ladies and Gentleman ! 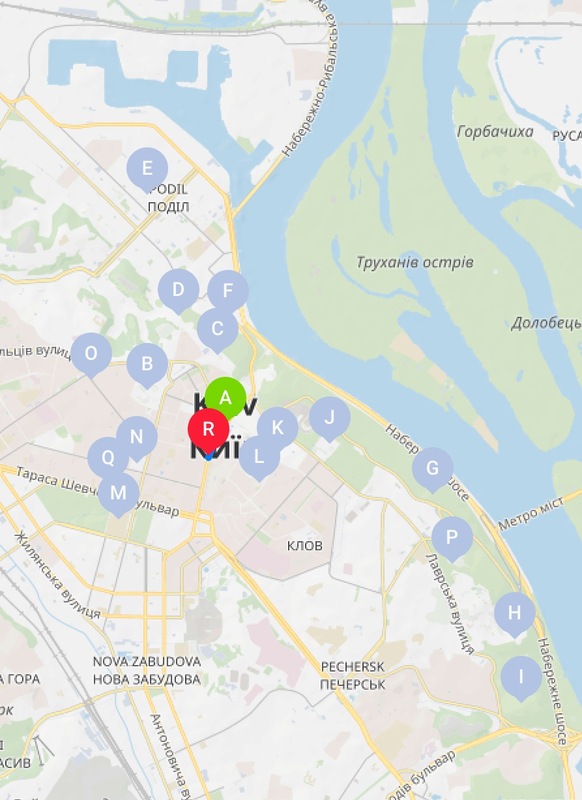 You can request the most popular and regular destinations for visiting as well as very specific objects of your personal interest, and we will try to optimize all. Just let us know about your time frames or travel conditions and we will help you to combine an optimal variant of excursions program. Take a possibility to get Russian / Ukrainian languages classes as an additional service from us: tutor service for English speaking customers. For lovers of gastronomic tourism there are Ukrainian traditional cuisine recipes on the pages of our web-site (green color texts). Cooked wheat or barley, mixed with poppy seeds, walnuts and, if the family could afford it, raisins, was sprinkled with melted honey. In poorer households, the melted honey was substituted with uzvar (compote of dried fruit). A popular traditional and ritual dish, porridge constituted an integral part of Ukrainian folk cuisine. Grain symbolized well-being, prosperity and happiness, walnuts - fertility of soil and welfare, honey - a careless and easy life, while poppy seeds, according to folk beliefs, protected from evil spirits. This acquired particular importance in winter holidays (Christmas, New Year and Epiphany), which are celebrated during the winter solstice. An assumption has been made that all these beliefs were shaped in the pre-Christian times, when people tended to attribute a supernatural force to plants. The supposition is based on the fact that a similar dish, Labajo, traditional Chinese New Year food, is made of rice mixed with different fruit and nuts. 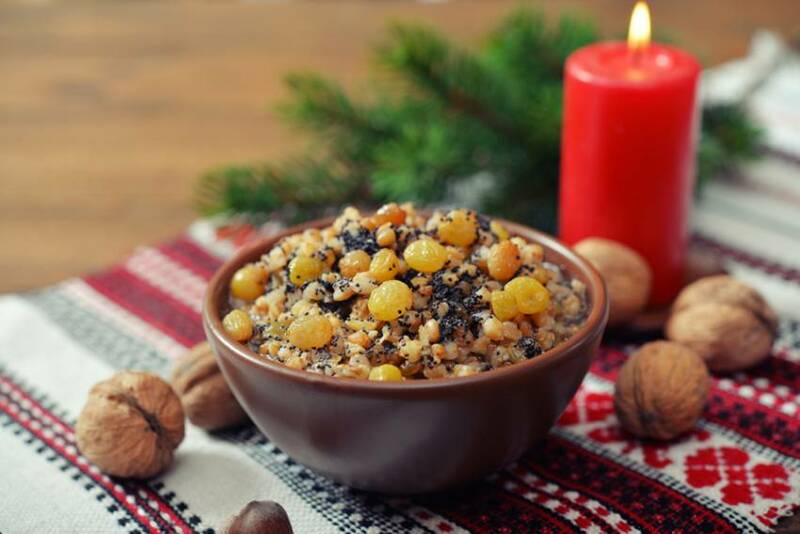 From time immemorial, the Greeks have been cooking panspermia - a New Year dish made of various cereals, poppy seeds and fruit. While cooking the traditional Christmas Eve meal, women watched for various tokens. If, still in the oven, the wheal rose over the pot's rims in a 'hunch', the rye harvest promised to be abundant and rye sheaves would be large, or 'hunched'. The slightly dried upper grains were skimmed and given to chickens. When a woman tossed the grains, she did not "cluck" for the poultry but wailed for them to notice the food themselves. If they did, there would be plenty of strong chickens next year.